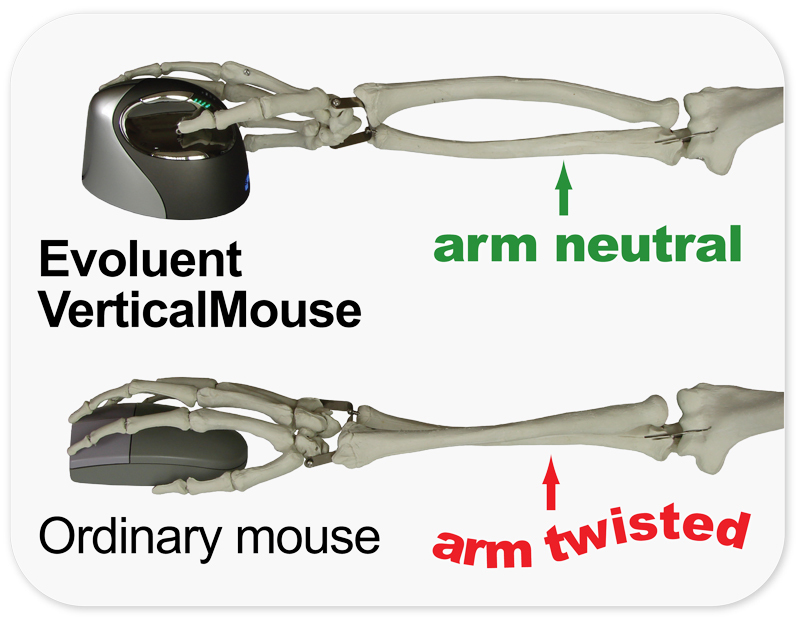 » Mouse Reviews » What is a Vertical Mouse? What Are The Benefits? What is a Vertical Mouse? What Are The Benefits? What is a vertical mouse? What are the benefits of using one? Well I’d like to share the best wireless vertical mice with you to shed some light on what a vertical mouse is and what it means to use one. Going vertical is definitely going to feel a lot different than your regular computer mice. Kind of like those that would make the switch from using a trackball mouse to an optical mouse, some say it may take a few days to get used to but it’s definitely worth trying out, especially if you have wrist pain using a mouse. With that, let’s get to a list of these mice! Vertical mice are best known for the comfort that they provide. 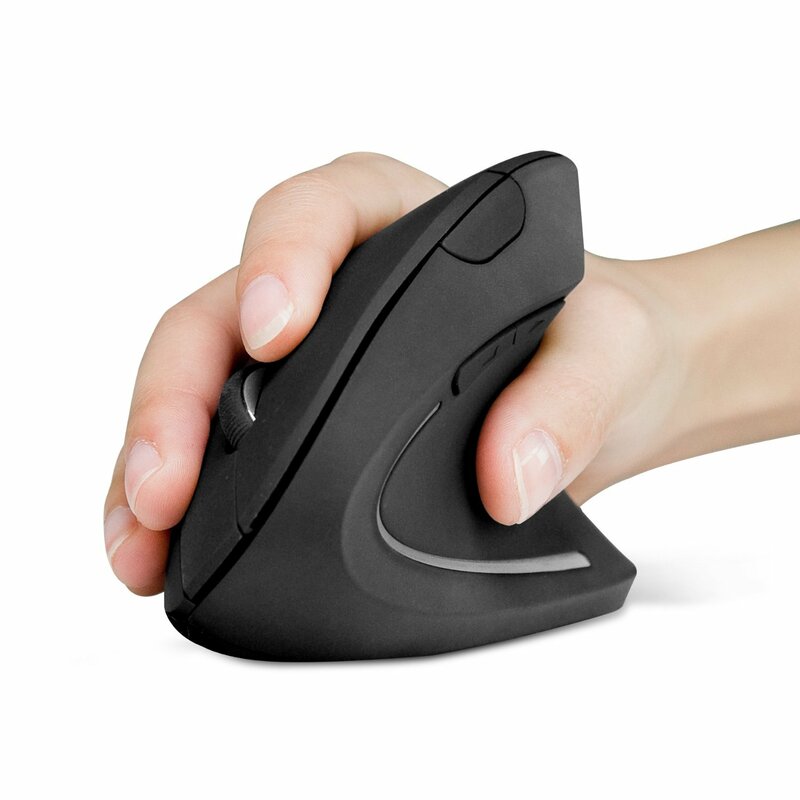 By using a mouse in the way that the vertical design is made for it puts your wrist at rest and allows for a smoother feeling. A MUCH more comfortable experience when using a mouse for a long period of time. A newer experience to using a computer. A cooler look, you’ll turn heads of those that see it. Some even have a wrist rest, but it’s not needed for that uber comfort. May take a bit to get used to, but worth it. A newer experience that maybe not everyone would love, personally I love it! Not all vertical mice are made with quality in mind. There are many different brands and types of vertical mice and I want to share the ones with you that are affordable but at the same time great. See how you have to hold a vertical mouse? It allows a better resting area for your wrist! It also makes your arm point in a neutral position which also helps with wrist comfort. Using a vertical mouse is kind of weird at first but when you get used to it you’ll actually really start to like it, at least in my opinion. My favorite part about most vertical mice is that the thumb buttons are placed extremely well and pressing every button on the mouse is very easy to accomplish. If you like to play games on your computer then know that vertical mice are also great for long gaming sessions. When I play for a long period of time with my normal mouse I usually feel a little bit of an uncomfortable feeling in my wrist, this is due to how the arm is rotated while using the mouse. Now I’d really like to make a list of what I think are the best, most comfortable and most affordable. Some being better for others, especially on the gaming side of things, so be sure to read the details about each product! Anker has been making great products for a while now and their wireless vertical mouse is definitely one of their best. 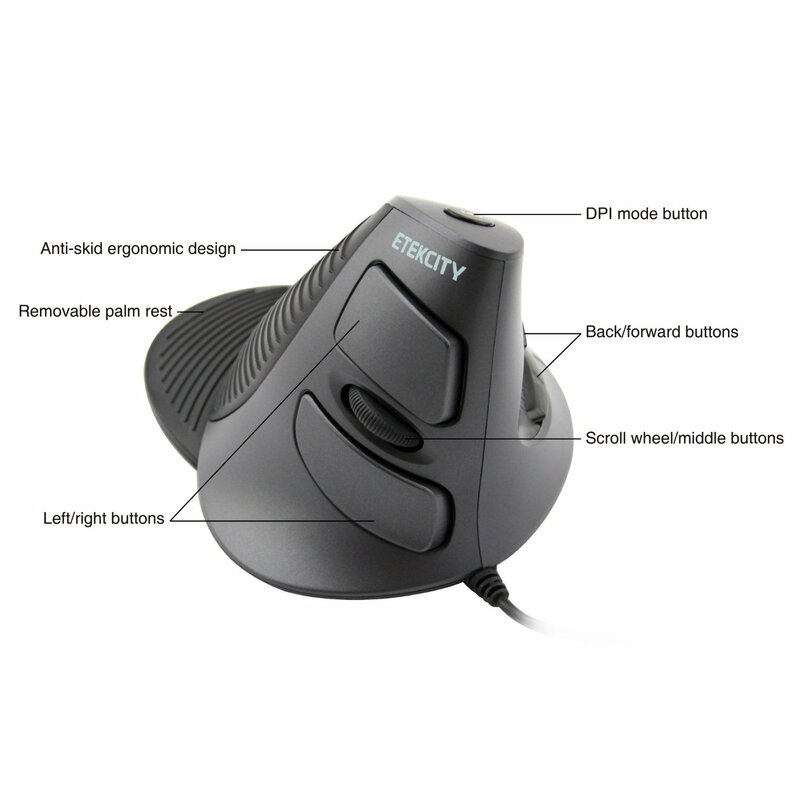 With an ergonomic design you can be ensured that no matter what your hand size may be you’ll be able to use this mouse. 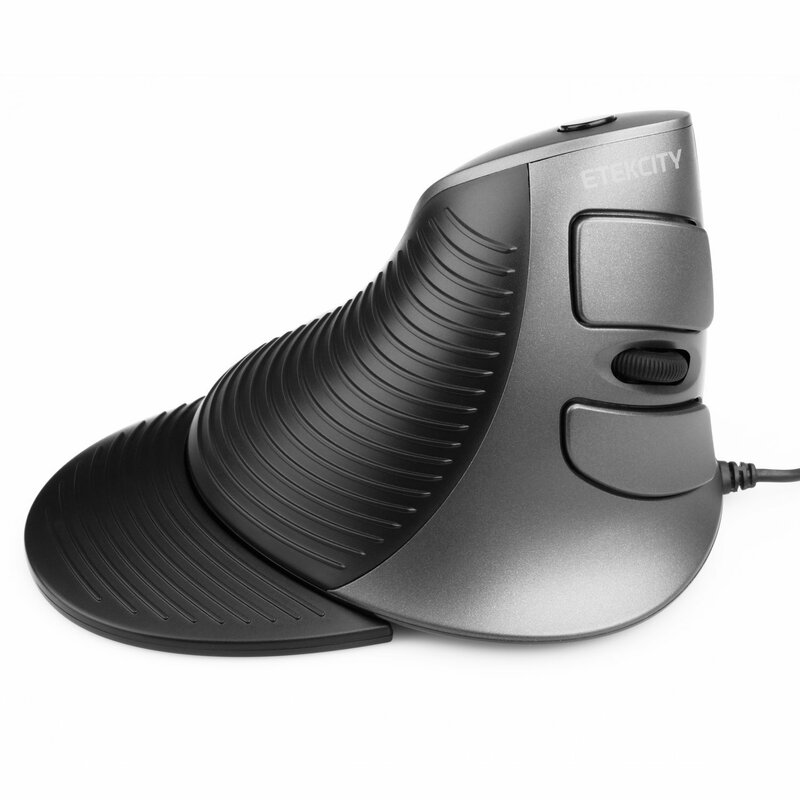 I love mice that have a great ergonomic design because then it’s ready for anyone that’s looking for a mouse like this! This one has 6 buttons in total. The left and right click, the scroll wheel button, the DPI switch and the two thumb buttons for forward/backward. The DPI switch will allow you to switch between the different DPI settings of 800/1200/1600 DPI. I really like the rubbery matte finish that is on this mouse because it feel a lot better and it feels like higher quality than say a plastic mouse. There’s just something about it that gives it that final great touch. One minor downfall that I see with this mouse would be its max DPI setting. If you’re a gamer, and you’re gaming on a higher screen resolution like 1080p then you’re going to be much more accurate with a mouse that has a higher max DPI setting. If you’re playing big game titles on a smaller screen resolution then I definitely wouldn’t worry about it! 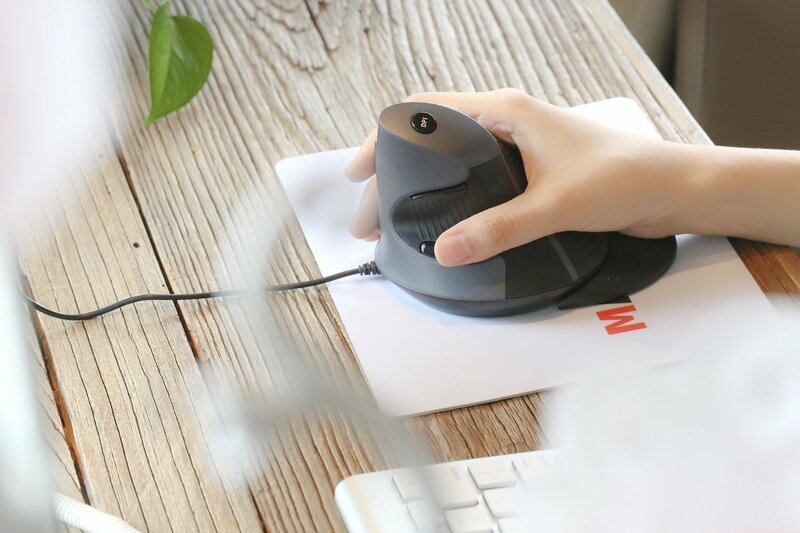 All in all if you’re on a tight budget but you still want a high quality vertical mouse experience then the Anker mouse is definitely the right choice for you. They also have a wired mouse that is designed just like this and it’s even cheaper as well! Be sure to check it out on Amazon! This mouse has a rubberized palm rest that is removable as well. I have personally never tried a palm rest with a vertical mouse before but something tells me that it’s probably pretty amazing. This mouse is a wired one so you’re basically ensured to never lose connection and/or have the battery power run out. The previous one is wireless with a wired option, wireless will be able to stand the test of time with batteries but personally I like my mice wired. This mouse also has 2 thumb buttons. 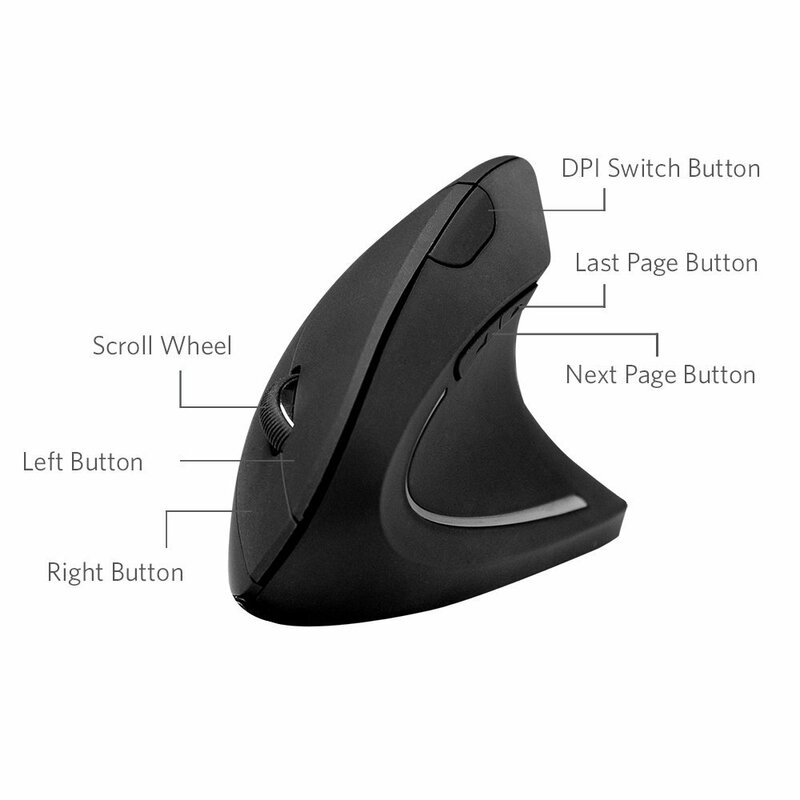 The thumb buttons are placed on the bottom part of the thumb area when you go to use this mouse. I think that would be a great position for the thumb buttons because it’s ease of access and it would just be very comfortable overall. I’ve used a vertical mouse with the thumb buttons on the upper part of the thumb area (like the one I listed above first) and I gotta say that it worked just fine. I’m sure the same exists with this mouse as well, comfortable use of the thumb buttons. This mouse also only has a max DPI setting of 1600, being able to switch from 800/1200/1600 is easy because the DPI switch is located right on the top part of the mouse. This mouse can do it all! Although it is not advertised as a mouse for gaming purposes, it could definitely prove to be optimal especially in the PC games that require precision aiming like first person shooters. The reason why I know that it would be great is because it has a max DPI settings of 3200 DPI. It can switch between 400/800/1600/3200 DPI with a switch on the back that toggles between the different settings. There is a light on the mouse that indicates which DPI setting you’re on. Now the forward and back buttons are kind of different on this mouse, but I like it. The forward button acts as a third mouse click button which you can see in the main picture above. This mouse click will allow you to move forward on pages while browsing the internet but it can also be customized in games to be used for something useful, like a med-pack for example. The back button is actually a thumb button placed above the thumb area. This mouse also comes with a palm rest much like the one I showed you on the last mouse that I mentioned. Sure it allows for great wrist comfort but you may want to remove it if it interferes with whatever kind of surface that you might be using it on. One unique aspect of this mouse is that you can adjust the different weights in a little cabinet area on the back of the mouse. The picture on the right will show in detail where you’re able to change the weight adjustments! 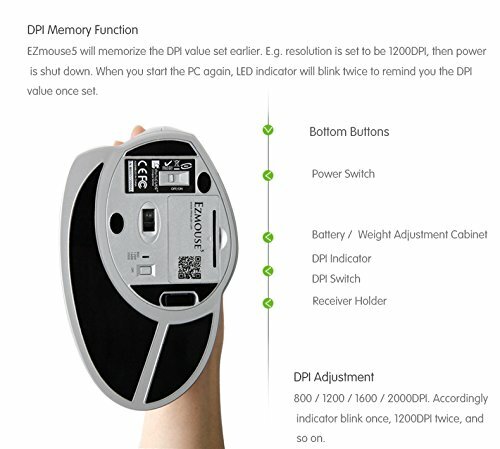 The back of the mouse is where are of the other buttons are at including the DPI switch, DPI indicator, the receiver holder, the power switch and the battery/weight adjustment cabinet. 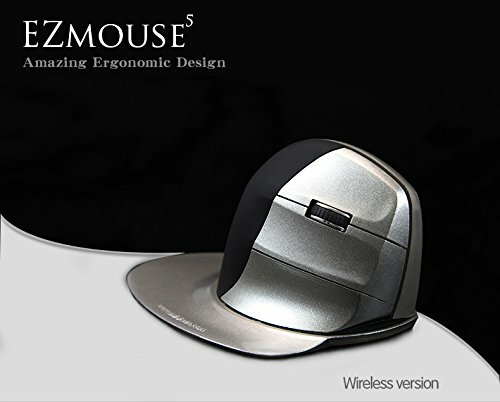 Back in 2009 the EZMouse actually won 10 awards due to its patent and the beautiful quality of materials that it is made out of. By the looks of it all, honestly, I’m not surprised at all! All in all I really hope that my post here helps you see what vertical mice can really be useful for. 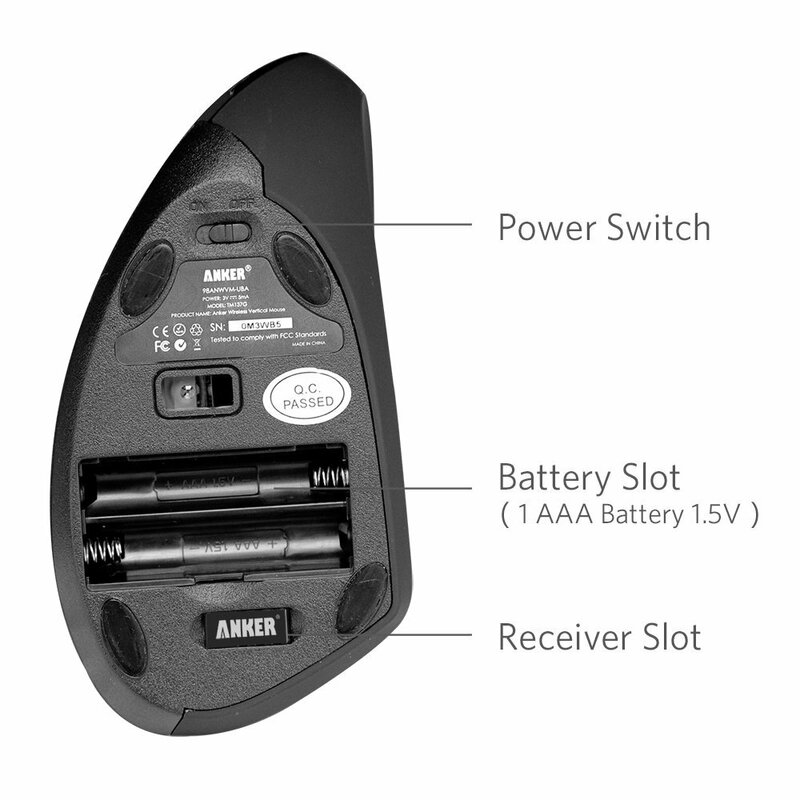 Be sure to check out the links to the different mice so that you can read even more about each product! So what do you guys think about vertical mice? Are they worth picking up and using? Tagged best wireless vertical mouse, vertical mouse, vertical mouse for gaming, what is a vertical mouse. Bookmark the permalink. 4 Responses to What is a Vertical Mouse? What Are The Benefits? WOW, I did not know about vertical mouses. My arm and hands are always fatigued after a long day of working online. The two things that bother me are writing and using a mouse for a long periods as it makes my hand feel almost numb. These are excellent mouses to use and I never realized that they could be that cheap.. I am know wondering why I have not switched yet. Great article I will be back for more great tips. Vertical mice definitely cure the wrist problems Brandon. I too have issues using a regular mouse for a long period of time! Hey Colton, very informative post here. I never knew that these existed and I don’t know why. These are now gonna be high on my to buy list. They look cooler than a regular mouse, more comfortable and not expensive. Sounds pretty good to me. They bring everything together at a good cost Diondre that’s for sure!